This lab focuses on the cellular and genetic aspects of atherosclerosis. 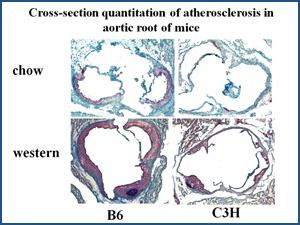 Current research projects involve the generation of new genetic crosses to identify quantitative trait loci (QTL) for atherosclerosis and associated traits in mice, evaluation of major QTLs for atherosclerosis by constructing congenic strains, and identification of genes underlying the major QTLs for atherosclerosis. We perform linkage analysis using mouse crosses to identify genes that are involved in the development of atherosclerosis. Linkage analysis is a genetic approach for mapping chromosomal regions of genes that contribute to such a complex trait as atherosclerotic lesions. A large number of F2 (intercross) or N2 (backcross) progeny derived from atherosclerosis-susceptible and -resistant inbred mouse strains are analyzed for parental phenotypes (traits). Chromosomal regions harboring the genes that determine the traits are identified with polymorphic markers that are capable of recognizing DNA sequence differences of the parental strains.